We humans have held some fascinating beliefs in our history upon this earth. We’ve believed that the earth was flat, that the moon was made of cheese, and that divine magic known as electricity came from Amber. Ancient Greeks also believed that Amber was sunlight trapped in stone, and was a symbol of the divine power of the Sun God, Helios. Personally, I like the beliefs that Amber is associated with the ‘element’ of Fire, and is a supposed protection against poisons. What’s really neat, however, is how many colors Amber appears in around the world. Most Amber is found in the Baltic Sea, and off the coast of Prussia, but a surprising amount is also found in South America. 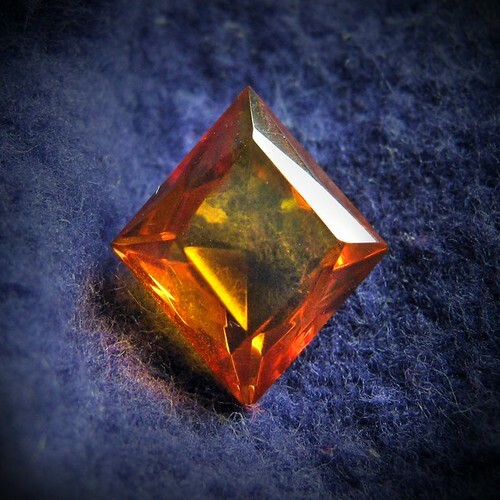 The rarest amber in the world is Blue Amber found only in the Dominican Republic, and is only found in jewelry grade material but rarely. The rest of the amazing colors of amber, from pale yellow to congac, to dark green are primarily from the Baltic and Prussia. The bulk of commercially available Amber is treated in one form or another to enhance stability, color, and clarity. Some treatments of Amber also include forming of Amber, due to it’s ability to be heated and shaped, like soft plastic. Keep in mind that Blue Amber is blue because of the way it nearly fluoresces in light. So in the dark, or in a dimly lit room, blue amber doesn’t look blue at all- but in the sun, or under light, well… it’s simply gorgeous! Amber has been used throughout history in so many amazing projects and art forms, and yet… probably my absolute favorite is the Amber Room that was in the Catherine Palace in Russia up until the second World War, when the panels disappeared under Nazi influence. Luckily, Russian craftsmen rebuilt the panels using traditional techniques, and the room was opened to the public in 2003. But not everyone has a roomful of amber- most of us just have a small piece of jewelry or two. What should you do to take care of it? Well, it’s pretty easy, actually. Just keep in mind that Amber is basically a natural plastic. Tree sap and and hardened resin- even fossilized resin, is fragile, and prone to scratching. So keep your pieces separate from one another to prevent marring the surfaces, and try not to drop it. When you want to clean your amber jewelry, use a soft cloth- and never a sonic cleaner. Amber is very porous, so make sure you don’t use any harsh cleansers, chlorinated water, perfume or hairspray around the stone, as it can absorb these substances, and damage the stone. A little bit of care, and you’ll have an elegant timeless classic. Simple as can be. Another wow! I had never seen blue amber. Thanks for the info. I’m a sucker for Jade myself (nephritic jade from British Columbia & New Zealand). Just just saw a very large Jade Buddha statue from BC in the newspaper; absolutely amazing. New Zealand Jade is both expensive & restricted for export –only art exported, not the raw green stone (a treaty condition with the Maori), however British Columbia jade is relatively inexpensive even when carved. You do need diamond tooling to carve Jade as it’s very hard indeed. I still lust after a Jade owl that I saw in Queenstown NZ (not for sale).